Yummy treats for junior party people! Keep the food very simple for toddlers parties. This makes it easy for them and easy for you. At a party very young children might not want to eat much as they will be busy playing. It is however best to have a set time when everyone sits down to eat together. This can be around a table but is just as easy if everyone sits on the floor (including parents and helpers). It is best however to try to stop children from wandering around with food. This might mean just putting some toys away to avoid temptation while the party tea is out. Please relax it is not your job to provide nutritious super food for your child and their pals so don't get too hung up on what other parents might think. Keep things simple with your toddler party food and don't go overboard with variety or quantities. The other thing is to keep things toddler size. So cut and chop to make bite-sized snacks and treats. Young kids in particular like the familiar so stick with a few sensible choices, raw carrots and breadsticks with a dip such as humous, grapes (cut these in half), cocktail sausages, potato crisps / chips, some simple sandwiches and a couple of choices of fancy cake or biscuit. Have simple squash drinks on hand - You may however find that many kids come with their own beaker. You really do not need more than this. You may also like to provide some food for the parents and children do enjoy seeing Mum or Dad tuck in too. If parents have hot drinks take extra care if there are kids running around. A stick of celery cut thin lengthways. If you think normal sausages are too dull try to present them party style. Its time for the Sausage Hedgehog. Cover a grapefruit or similar with brown paper or paint it. Add eyes and a mouth / tongue. Then stick in your sausage on sticks prickles. A sausage hedgehog is even more fun if mum squeals "ouch" every time someone pulls one of the sausages off his back. These cakes are always a "must-grab" item for toddler and just show that things do not need to be complicated. Mix the sifted icing sugar with just enough warm water to mix it in and provide a usable icing paste. If desired add a few drops of food colour. Whisk the milk, eggs and sugar in a bowl until doubled in bulk. Bake in a pre-heated oven at 180C for about 10 minutes until risen and golden. For the icing beat together the cream cheese, icing sugar, lemon zest and juice until smooth. Fill the hole left behind with a dollop of cream cheese icing. Run run as fast as you can! You can't catch me I'm the gingerbread man! Do the children know the story of the gingerbread man? Perhaps you could incorporate it into your party tea and at the end offer around a plate of gingerbread men. Even funnier when all the parents go "ooh" as the kids all take the first bite together. Mix the sugar and butter together in a large bowl. Sift all the dry ingredients in another bowl then gradually mix these into the treacle mix. Mix well using a beater or food mixer until you have a firm dough. Rolling out - Gingerbread dough is particularly sticky. You might prefer to work with small amounts at a time. Place about a quarter of the dough on a floured surface or a piece of kitchen foil. Place a piece of cling-film over the dough and roll with a rolling pin. The film should stop the dough sticking to your pin. Roll out to slightly less than 1cm thickness. 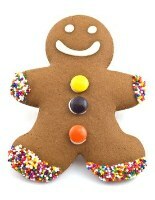 Use a cookie cutter (in the shape of a Gingerbread Man) to cut out as many men as you can manage. Bake at 170C for 15 - 25 minutes until the gingerbread is firm to the touch and just starting to go dark around the edges. Do you have any good toddler party food ideas? Send them in to us and we will include them on this page.